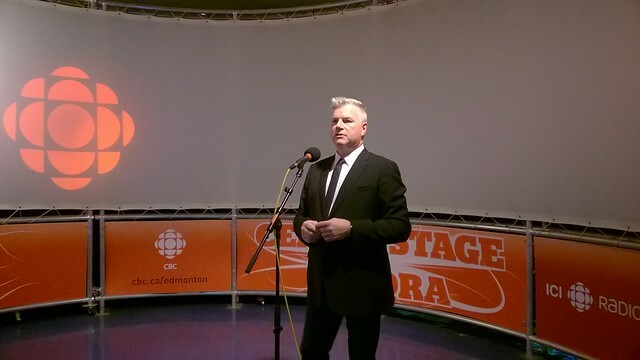 CBC Edmonton hosted an event last week to share information on its latest programming changes. Starting today, you can watch Edmonton AM on TV from 6-7am every weekday. 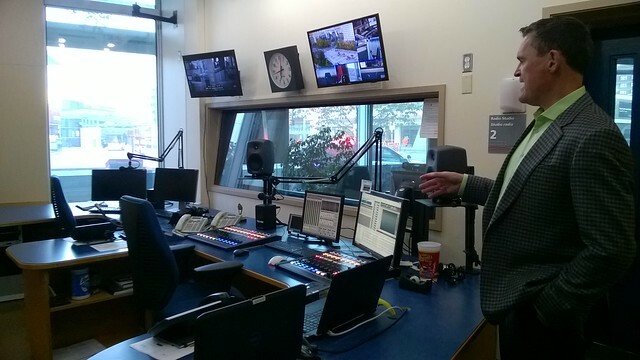 The radio studio has been outfitted with video cameras and has been “spruced up” a bit for TV. The reason for this new radio-on-TV approach is that they’re cutting an hour from the news in the evening (but they are mandated to have a certain number of hours of original local content…so this seems like a clever skirting of the intent of that requirement, but I digress). Starting October 5, CBC News Edmonton will run for just 30 minutes starting at 6pm (it currently runs 5-6:30pm), and will “focus more on context” while also pushing social media so viewers can “see themselves and be a part of the newscast.” The late night newscast will run from 11-11:30pm and will be anchored by Sandra Batson. The TV set is getting an update too. The other change is a greater focus on digital, as is happening across the country as a result of CBC’s 2020 strategy dubbed “A space for us all”. When pressed, News Director Gary Cunliffe couldn’t give me any details on what exactly “more digital” means (I think new hires seem unlikely unless the government and/or budget changes), but he did cite Laura Osman as their first digital-first journalist and an indication of what to expect (which is great news). No word on whether CBC.ca will get a responsive overhaul anytime soon, which would be high on my wishlist. Brittney Le Blanc has announced she is leaving Gastropost. She’s making the switch away from media to apply her social media talents and experience to AMA’s Online Travel Services. Congrats Brittney! After nearly six and a half years, The Unknown Studio is coming to an end. “After much deliberation, Scott and I have decided to hang up our mics and headphones, and end the Unknown Studio by the end of 2015,” writes Adam. They promise the final episode will be a Christmas special and encourage you to get in touch if you’d like a limited edition, tainted Unknown Studio mug. I’m sad to see them go. Thanks Adam & Scott for all the great interviews you have shared with us! They leave as podcasting (finally) seems to be gaining steam here in Edmonton. So much so that Karen has launched a new podcast roundup and will host the first Edmonton Podcasting Meetup. Karen’s own podcast has two new episodes featuring local social media folks for you to check out. Episode 10 is with Jenna Marynowski of After the House Lights, and Episode 11 features Erin E. Fraser, co-host of Trash, Art and the Movies. After five years of blogging, Jenifer Schaefer is bringing City and Baby to an end. I love her parting thoughts and will miss having her blog in our vibrant community! As I noted last week on Twitter, Citytv Edmonton will be leaving downtown by the end of the year. Rogers is consolidating its TV operations with its existing radio operations at the Gateway Boulevard location. CKUA is looking for a Content Director, a “pivotal leadership role that will shape the future direction of the organization.” The deadline to apply is October 19. Global Edmonton has posted some cheeky weather team promos with the tagline “weatherproof your day”. I’m amused they had to fake snow to make a weather commercial in Edmonton. Here are some photos from the K97 & CJCA reunion event that took place recently. Congrats to Stacey on the improvements to popular Edmonton wedding blog Yegwed.com. Here is Karen’s latest roundup of local blog posts. Michele McDougall and Jason Roberts, both of whom are off-the-air at the moment, joined Ryan Jespersen on the weekly roundtable. Here is Omar Mouallem‘s debut in Maclean’s magazine: The donair, adored by the East Coast, heads south. Congrats Omar! Mind your manners! That’s the message that SONiC 102.9’s Garner Andrews has been promoting lately. Here’s an Edmonton Journal article from September 22, 1954 talking about television coming to Edmonton. CFRN went on the air on October 25, 1954. The October edition of the Edmonton Broadcasters Club features Bruce Bowie. Here is a feature on Shayne Woodsmith’s online project that is now a book, Faces of Edmonton. An orange and red sign, with the Edmonton Journal and Edmonton Sun side-by-side. Who could have seen this coming just a few years ago? Could Edmonton be the true Hollywood North? Might be wise to keep Betteridge’s law of headlines in mind for this one. Big Brother Canada was in town recently recruiting for its upcoming season. If you missed it but want to apply, you can do so here. Speaking of reality TV, how did The Amazing Race Canada do in Edmonton? They showed off some unexpected locations. No West Edmonton Mall, mercifully. Techmeme remains a daily-read for me (multiple times a day if I’m being honest). Here are some lessons from a decade in the aggregation business. According to a recent survey by Mark Kassof & Co., lots of people would miss FM radio if it were to go away, but very few would miss AM radio. Publishing platform Medium has reportedly raised $57 million in a round led by Andreessen Horowitz.